Analog media can really take you back in time—literally. It has become a semi-frequent metaphor-Macguffin in time travel-themed short films, such as Jesse Atlas’s Record/Play and Jonathan Dillon’s Celluloid Dreams. A tweedy inventor will also bust out the old school film projector to right a past wrong in Michael Lippert’s short film Reversal (trailer here), which screened during the 2016 Fantasia International Film Festival. Just as Frank was poised to secure funding for his time travel device, his eternally patient wife Emma was murdered by a home invader. To add insult to injury, the liberal courts let the killer off easy, citing his mental health issues. However, Frank had been secretly conducting his time travel experiments in their flat, so he just so happens to have the relevant photochemical film to allow him brief trips back in time. That old film stock sure could burn up fast, couldn’t it? As a result, Frank’s supply might not hold out long enough for all his time travel plans. Frustratingly, Lippert’s screenplay never even attempts to explain the mechanics of its system of time travel. This is a mistake, because that sort of scientistic mumbo jumbo is one of the pleasures of the sub-genre. However, the old couple’s relationship feels realistically “lived-in” and ultimately quite poignant. Bill McGough and Donna Steele play off each other nicely and give the short film mature credibility. Reversal is also quite a handsome production, especially by genre standards. Cinematography Austin Rink and production designer Manuel Perez Pena give it a stylish look that evokes both past nostalgia and great cosmic portents. It is a fully realized film that should satisfy fans of Somewhere in Time and Frequency. 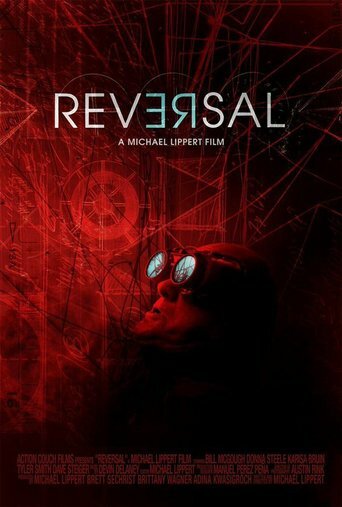 Recommended accordingly, Reversal had its Canadian premiere at this year’s Fantasia.